The Anja Beran Foundation is a non-profit making foundation having legal capacity under civil law. The main focus of the foundation, set up on 9 September 2009, is to practise classical equestrianism and increase people’s awareness of it, as only horses which are treated well and gymnasticised with carefully conceived exercises remain healthy, content and able to perform until they reach an advanced age. The Anja Beran Foundation also supports animal welfare and environmental protection because this is also an integral part of a harmony-orientated, responsible attitude to life – the objective is to encourage people to develop a profound sense of respect for animals and nature, and make this stance a fundamental position of every individual person. 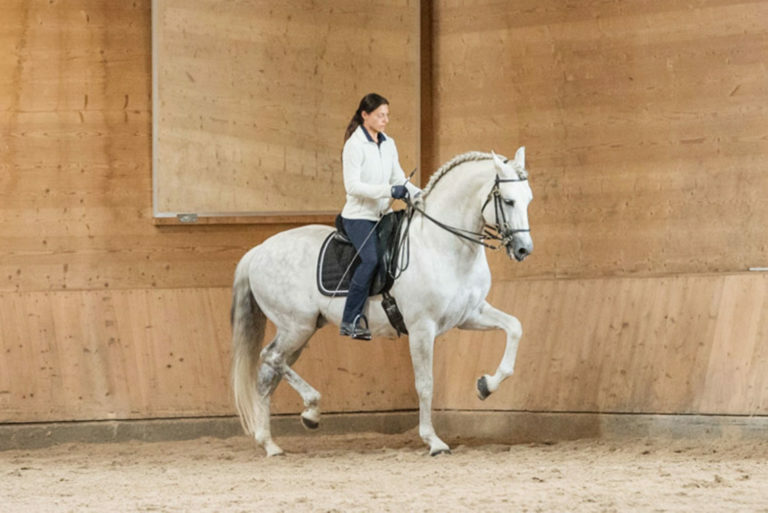 Maintaining classical equitation and inspiring more and more people to horse riding in the classical sense is the main focus of the Anja Beran Foundation. The classical dressage helps the horse to find its mental and physical balance. Classical dressage instructors treat their horses and students with respect and humility. If you want to be a true rider and instructor, you must always critically review your actions. Only people with diligence, discipline, respect and love are able to preserve the values ​​of the classic riding culture. The foundation wants to help stop the increasing decay of these values ​​and to inspire more and more people for equestrian riding in the classical sense. Numerous events at Gut Rosenhof and around the world, as well as educational films, books, specialist contributions, lectures and more, give interested riders the opportunity to deepen their knowledge of a horse-friendly educational path and to gain valuable insights for their daily practice. The ongoing training of horses of all breeds according to classical principles impressively demonstrates how this path leads to satisfied and healthy riding horses. Please support us in our work. If you support the objectives of the Anja Beran Foundation there are many ways to show your support. Simply get in touch with us for a personal discussion at info@anjaberan.de. We are always delighted to hear from anyone who wishes to get involved with our work in any way and support our objectives! For us animal welfare means actions not words. Respect for creation requires us not only to take responsibility for our own horses and animals, but also to provide support for all other animals. This is why our Rosenhof has meanwhile become a home for a number of animals which would not have had a chance elsewhere. Our cats, for example. Some of them come from the local animal shelter in Marktoberdorf. Others have simply turned up “out of the blue”, so to speak, or have been adopted from surrounding farms, where they were “superfluous”. Naturally we have had all the cats at Gut Rosenhof castrated, and we take care to ensure that they are wormed and vaccinated regularly. The situation regarding our rabbits is similar. We have acquired quite a number of those too. One came from Vienna with a pupil. The others have all come from our neighbourhood – and because there are meanwhile quite a number, we have built a special rabbit-run for them where they can hop around and play together, eat, snooze and enjoy their lives as rabbits. We have only intervened to prevent them breeding as rabbits – otherwise before long, there would be more rabbits than horses at Gut Rosenhof. And sometimes we rescue animals which we find in the woods! Once it was a pot-bellied pig, which had obviously been deliberately abandoned. At Gut Rosenhof, in addition to a new cage, it also found some ready-made friends. Because we already had some pot-bellied pigs, which had also been forced to find a new home. They oink about quite happily with our other senior residents. Because Gut Rosenhof is also a retirement home for goats, camels, lamas and some horses. Animal protection for us is practised animal welfare. 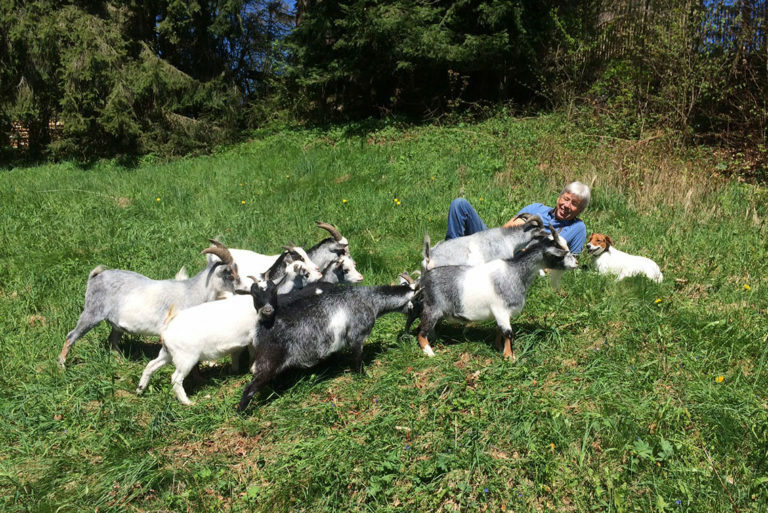 For this reason the Anja Beran Foundation always reacts flexibly and fast, wherever it is necessary and (vitally) important for the animals‘ well-being. Gut Rosenhof is located in the midst of fields and forests, i.e. in the heart of the countryside, which we treat with the same respect as our animals. 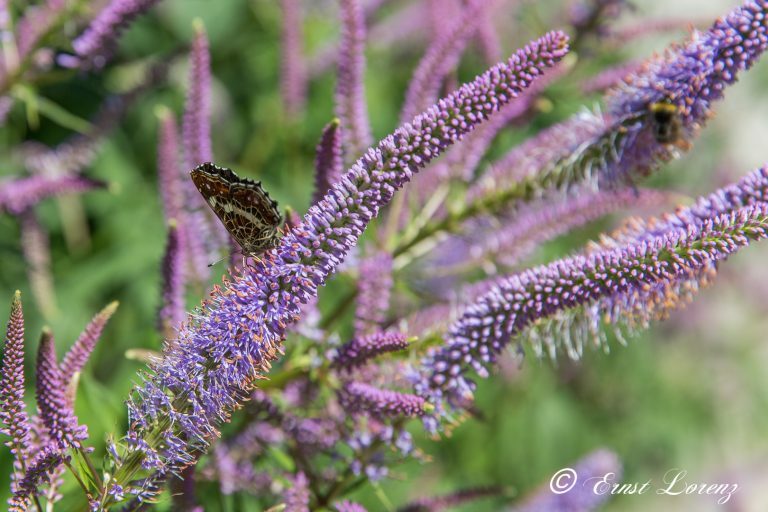 Our natural garden provides an important contribution to biodiversity for plants, birds and insects alike. Thanks to the expert support provided by Gartenmanufaktur Nüssler, the natural garden at Gut Rosenhof flourishes – even though the climate conditions can be quite rough at an altitude of nearly 1000 m above sea level. The fields and woods owned by Gut Rosenhof are cultivated carefully and sustainably. Our extensive red deer enclosure contributes to the conservation of cervus elaphus which is becoming increasingly rare in Germany. In 2015 we started a project to protect fawns from mowers and purchased ten “fawn-rescuers”. When the fields are mown for the first time in May, fawns face a great danger! Newly born and still too weak to walk around, the mother leaves them to rest in the long grass. The farmer can often not see the hidden fawns so they get caught up in the mowers and injured, causing them to suffer a painful death. Since spring 2015, farmers can request the fawn-rescuers for their fields free of charge and a team from the Anja Beran Foundation sets up the equipment. By means of the most modern technology, the deer are ‘scared off’ as it is known in the specialist terminology of hunters. The method is successful as well as gentle for the animals as, thanks to the sophisticated system, the deer are not fundamentally frightened away from their grazing area. And the farmers also benefit from this system – for one thing they do not risk violating animal welfare laws and they also avoid the health risk of hazardous botulism which arises if an animal cadaver gets into the grass cuttings.